A hammer drill is an electric drill that delivers the hammer-like action while the bit of the drill keeps revolving to add a greater impact in the hammering action. As the bit moves in a rotary motion, it keeps giving fast and hard blows and demolishes solid raw materials like brick, wood or stone in a much easier way than using ‘physical hammer’ manually. This hammer drilling depends on the preference of the person and the necessity of the situation that which would be used- physical hammer or hammer drill. One can choose to work with a physical hammer at his will. But when there is short deadline with a pile of work on the shoulder, using hammer manually may not prove to be a bright idea. In those situations, the hammer drill comes to work and finish huge work piles in considerably little time. There are many manufacturers of hammer drill in the market. Every day, new product slides in, and it is becoming hard to track the right products among the junk ones. Makita is one of those names that give general people a sense of security while buying a power tool. Among their many decorated products, we have chosen five hammer drill products to analysis; and these are in our opinion, few of those finest hammer drills available right now. Makita XPH102 Hammer Driver-Drill Kit is a compact workhorse that provides proper torque and speed to the work while the Lithium-ion battery backs it up to work longer time. This cordless hammer drill is ideal for portability. With the compact size that it comes in, this portability makes this drill a desirable one. The Lithium-ion battery gets fully charged just in about 30 minutes, and it has a high ratio of retaining the charge while working and while not. This hammer drill can function on metal, wood, masonry, concrete in dual modes. As per the necessity, it can act as a driver drill and when time comes, a hammer driver-drill. This drill has a Makita-built motor with four-pole in work. 480 in. lbs. of maximum torque can be generated. It has a variable speed design of 2 transmission speeds (0-600 RPM and 0-1900 RPM) & (0-9,000 BPM and 0-28,500 BPM). In high-speed setting, the machine can go up to 28,500 BPM and 1,900 RPM when necessary. Makita batteries have always upheld their positions in the front row. The 18V Lithium-ion series is one of Makita’s most famous battery lines. This cordless machine is also powered by Makita’s leading 18V Lithium-ion sliding battery. As now with this superior battery the hammer drill can get charged very quickly (fastest charging time in its category) and work for a longer period, less time will be spent on the charger and more time will be available during work hours. Makita’s Star Protection Computer Control is a new generation communication technology. It comes in aid of those products of Makita that are equipped with Star Protection. This feature allows the machine and the battery to exchange data while working and the user can monitor the condition of the machine and battery together. In this way, any overheating, overloading or over-discharging can be marked easily, and steps can be taken when necessary. Its built-in dual LED lights help the user to work flawlessly in a tight space or in a dimly-lit place. Through and through the gear is metal constructed and it ensures the increased durability of the product. To give the user a comfortable experience, a rubberized soft grip is used. Overall it makes an excellent choice of itself who want to go for a top class hammer drill at home. Makita XPH012 18V LXT Lithium-Ion Cordless 1/2-Inch Hammer Driver-Drill is a beautiful balance between performance and versatility. With its dual mode, it can serve both as a driver-drill and as a hammer driver-drill. This dual function saves the user from carrying two different drills to the job site and combines the comfort into one. 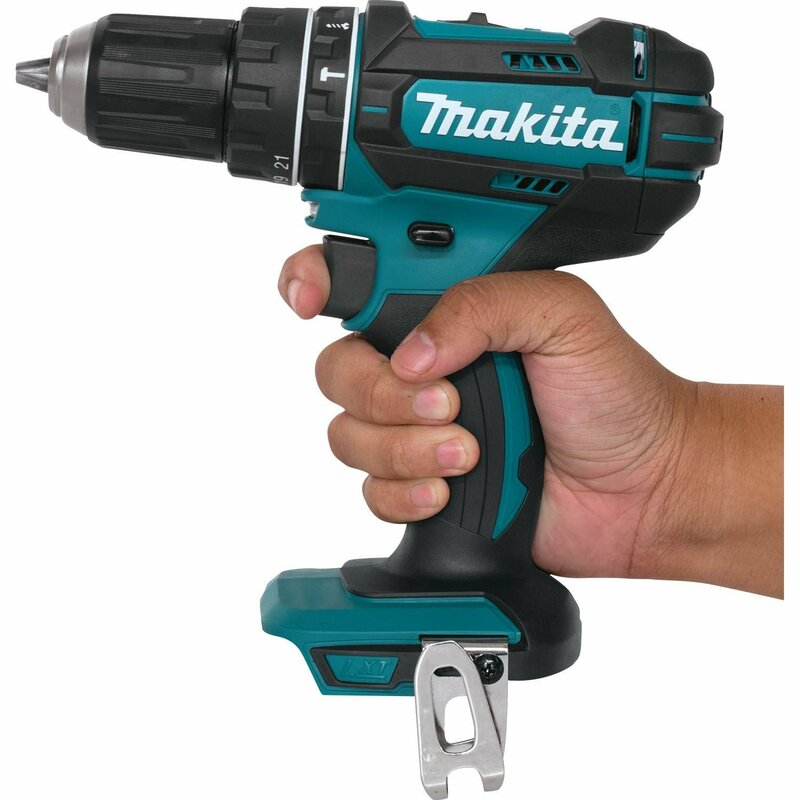 This drilling beast comes with a four-pole motor made by Makita. This powerful motor delivers a torque of 480 in.lbs. The full-metal transmission comes with 0-400 RPM (low-speed setting) and 0-1,500 RPM (high-speed setting) and provides service for a larger array of driving and drilling applications. To drill through concrete and masonry, the 0-6000 BPM (low-speed setting) and 0-22,500 BPM (high-speed setting) work ideally. Its light design helps the user work with it in hand easily. With a battery, it weighs only 4.0 lbs. This surely is a great advantage to those who would want to work with this tool for a longer time. The compact design of this hammer drill boasts a body of 8-1/8 inches long and the ergonomic shape fits in hand so smoothly that it can barely be recognized as a tool. You may like also: Top 11 Hammer Drill for easy use! The cordless equipment line-up runs with 18V Lithium-Ion-Slide battery. This battery is a part of Makita’s renowned 18Volt Lithium-Ion batteries that run the world famous largest cordless equipment line-up of the world. These batteries charge fastest comparing other products in its category. With these batteries on board, now one can plan more time on worksite than sitting beside the charging station. This great machine also comes with a built-in LED light that helps the user to work in the dark or in a confined space where there is less visibility. In those dire situations, this LED light will come handy for accurate drilling, and the chances of mishitting will come to a minimum. 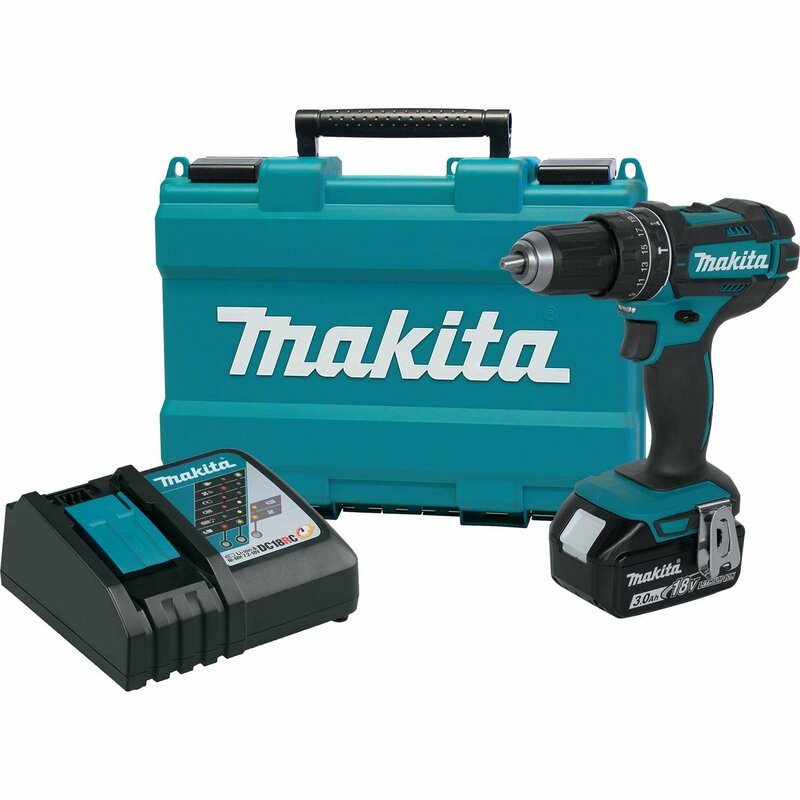 3-year warranty is a great comfort, and it shows the confidence of Makita on their own. For all kinds of material- steel, concrete or wood, Makita HP2050 Hammer Drill comes just right off on the table with its blasting performance. This 0.75 inch corded hammer drill is a work-monster and can handle the most power-demanding applications on the job site. It comes with a dual mode- ‘Hammering only’ and ‘Hammering with rotation’. The mode switch does the swift change between these modes. Using these modes in working, one can go around all sorts of tasks that require instant changes between hammering action and drilling. The carbon brushes ensure increased comfort for the user for longer using. Besides this, the machine has a ‘No hammering when idling’ feature. This enables low vibration situation. The 6.6 amp motor delivers powerful performance for heavy applications. With this motor on board, this machine is just the right thing on hand to work off any kind of drilling and fastening work you were waiting to do. 2 variable speeds of 0-1200 RPM and 0-2900 RPM work wonder with the speed control dial. This machine has protective measure against gear damage. If any bit binding occurs, the clutch that limits torque will automatically disengage gears and will refrain from succumbing to any possible damage. This monster hammer drill has a control dial and a clutch that limits the torque when necessary. In the case of bit binding, the clutch disengages automatically. Any kind of accidental disengagement is prevented by stop mode selector. This hammer drill comes light and with a rubberized grip that feels comfortable in hands. This grip prevents hand fatigue from using it for a longer time. It also boasts of some amazing features like larger trigger switch, recessed lock button, all-ball bearing structure, and 360-degree swivel handle. The low noise and reduced vibration is an added advantage that will protect the ear after a long day of work with this Makita hammer drill. Powered by none other than a Makita brushless motor, the Makita XPH07Z LXT Driver Drill is a powerhouse for longer run-time. It is built for rugged job-site conditions. For all kinds of driving and drilling applications in masonry, wood, and metal, this work-monster comes with 1090 in.lbs. torque and finish the job perfectly with total finesse. The brushless motor also ensures increased speed and power. This electronically controlled motor uses accumulated energy to change the RPM and torque to match the changing power necessities of different applications. This brushless motor also enables the machine to run in a cooler temperature than many other products in the market. It provides about 50% more power than the older models. The 2-speed transmission is made of metal, and the variable speeds (0-550 RPM and 0-2100 RPM) will also support a wide array of applications. From light to heavy works, this hammer drill just works perfectly fine. This amazing hammer drill comes with 18Volt Lithium-ion series battery, which has the tag of running the largest cordless power-tool line-up of the world. With their fastest charging time, working on a tight schedule is easier now. Rather than waiting for the machine to get charged up, you can have the facility to work all day with a minimum charging time. Without the battery, it is just 5.9 lbs. in weight. The ergonomic design boasts an 8-1/8” long body that fits naturally in hand. It is easier for a user to work longer periods. This hammer drill also has a LED battery gauge that shows battery level in three stages. The 3-year warranty on tools and 1-year warranty on the battery is also praiseworthy. Batteries: 1 Lithium ion batteries required. Among many cordless hammer drills in the market, the Makita hammer drill line-up is presumably one of the bests that provide power and prudence at the same time. And those best of Makita’s the Makita XT273R Cordless 2-Pc. Combo Kit sits on the top of the shelf. The all-metal gearbox performs equally well in metal, wood, and masonry. The ½ inch hammer driver-drill is the perfect complement to this gearbox. It weighs 3.4 lbs. that is easy to hold. Top of the line impact driver is only of 2.8 lbs. The weight makes the user comfortable for a longer period of use. With the torque of 1420 inch lbs. this hammer drill delivers just what it is asked of. These machines use 18 Volt compact 2.0 Ah batteries that get fully charged in only 25 minutes. With these batteries on board, the idle time while charging comes to a minimum and the user can make the most of his day with this combo kit in hand. The batteries have LED indicator that tells the charge level accurately. These slide-style batteries are the part of popular 18V Lithium-ion series that powers the largest cordless power-tool line-up in the world. With two variable speeds (0-400 RPM and 0-1500 RPM) this hammer driver-drill runs like a workhorse having the 4-pole motor by Makita on board. This motor delivers 480 in.lbs. of maximum torque that can easily handle light to heavy works. The impact driver runs at 2 variable speed as well (0-2300 RPM and 0-3200 RPM). With the torque of 1420 in.lbs. this 2.8 lbs. machine works wonder when falls in the right hands. For rugged work situations, the impact driver has Xtreme Protection Technology (XPT). This feature saves the impact driver with its advanced water and dust resistance. To save the battery from any kind of damage, these machines have Star Protection Computer Controls, which will prevent the machines from getting over-heated, over-loaded or over-discharged. With many hammer drills in the market, it is not easy to make a choice that will be considered a good one even after years. That is why choosing the right brand is important. The Makita hammer drills have always provided a better quality of service to the consumers who seek value for money. For those who want a hammer drill that will last for years, can surely go and have a look at the decorated line-up of Makita hammer drills. I am Richard A. Koons. Working in this field around 20 years. You can call me a tool freak. I don't even know how many tools used in my last 20 years. The most interesting thing about me, that is I love to write blog and travel. HOW TO DRILL INTO A CONCRETE? Drilling Boss Copyright © 2019. Disclaimer: In this Blog we use some Affiliate Link from Amazon. Drillingboss.com is a participant in the Amazon Services LLC Associates Program, an affiliate advertising program designed to provide a means for website owners to earn advertising fees by advertising and linking to amazon.com.